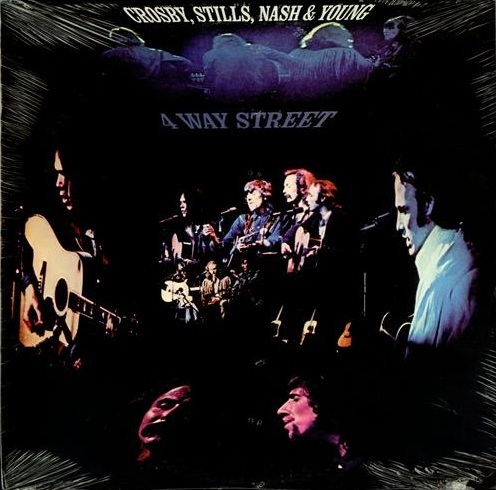 4 Way Street is the third album by Crosby, Stills & Nash, their second as Crosby, Stills, Nash & Young, and their first live album. It was originally released in 1971, shipping as a gold record and peaking at #1 on the Billboard Top Pop Albums chart. A document of their tour from the previous year, the live recordings presented were taken from shows at The Fillmore East, New York, June 2–June 7, 1970 The Chicago Auditorium, Chicago, July 5, 1970 and The Forum, Los Angeles, June 26–June 28, 1970.